Diamond Silver Engagement Ring : LOVE2HAVE in the UK! 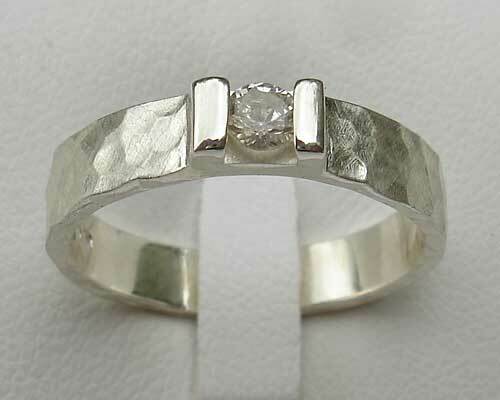 A diamond silver engagement ring in hammered sterling silver that is also featured as a wedding set listing on this website too. If you are looking for a largish diamond for your wedding and engagement but are on a budget, then this is the ring for you. The ring is 4mm in width, and the diamond is 3mm in width. It is available in a silver matt or a polished finish. The matt finish is pictured - please state your choice in the comments box at checkout. Other stones are also available, so please email for further details. 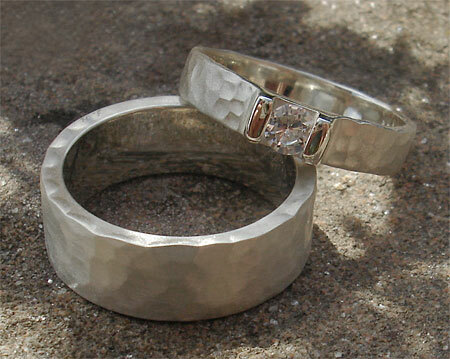 As mentioned, a matching plain and men's wedding band are available too in larger widths and sizes and when combined with a single purchase will save you, even more, money. To take us up on this offer, please do contact us. Precious stone(s) Available: 1 x 3mm white diamond. Returns Policy: You may return this UK made silver engagement ring if it is not to your satisfaction as long as it is not engraved. Please see our terms and conditions.